We believe it is important to have a standard trustless implementation for improving the privacy of it’s users in the reference client that provides a high degree of privacy. The greatest challenge when improving privacy and fungibility of a crypto-currency is doing it in a way that does not obscure the entire blockchain. DarkSend uses the fact that a transaction can be formed by multiple parties and made out to multiple parties to merge funds together in a way where they cannot be uncoupled thereafter. Given that all DarkSend transactions are setup for users to pay themselves, the system is highly secure against theft and users coins alwaysremain safe. • Larger and Faster Blocks. PNX relies on a block size of 2MB and a block time of 60 seconds. This effectively allows PNX tohandle a transaction volume 20x greater than Bitcoin’s. • Flexible Blocksize. Roughly 6 months into PNX's life cycle, the network will switch from a consensus algorithm of mining-driven Proof of Work to staking-driven Proof of Stake. Upon this second stage, the protocol will switch to a dynamic blocksize that will adjust in size to any increase in transaction volume. If the network detects that more and more transactions are stuck in the unconfirmed queue (known as the mempool) it will dynamically increase the size of the subsequent blocks to handle the increase in transaction volume. This is the equivalent of a mining difficulty algorithm applied to block sizes. • Masternodes. 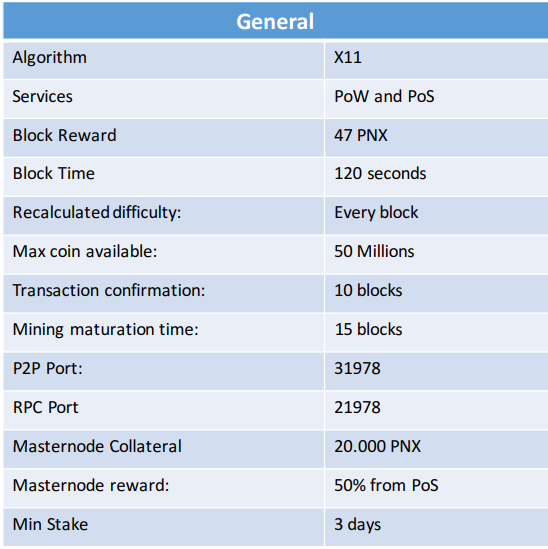 The PNX network constitutes a 2-tier architecture, where the first tier is the protocol level, mining and staking and the blockchain itself. The second layer is its masternode array, being a large network of high availability dedicated servers operated by users. These users provide enhanced services to the network (such as faster transactions, anonymous transactions, voting validation and others) as well as contain a full copy of the blockchain.